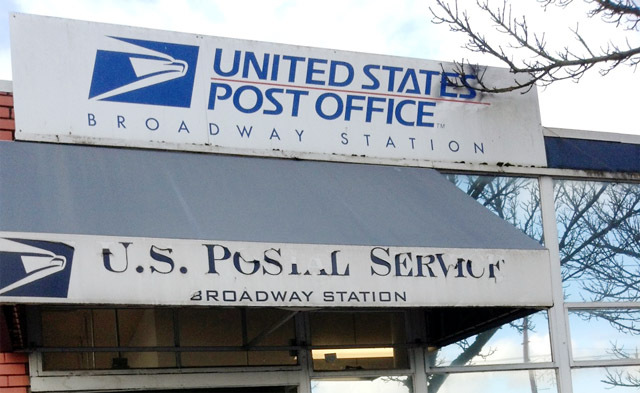 Don Glickstein from Seattle provides an account of the relocation of Seattle's Broadway Station post office. 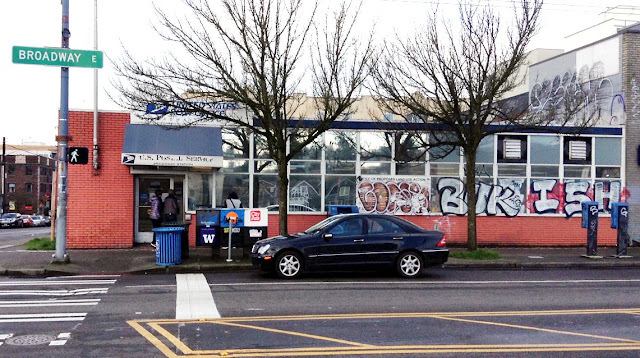 Broadway Station is located in the city's Capitol Hill neighborhood, which has come under increasing pressure by developers in booming Seattle. Much like Silicon Valley, Seattle has benefited from the influx of tens of thousands of Amazon and other well-paid tech workers. Gentrification abounds and the progressive city continues to develop. Seattle recently expanded its Link light rail system to connect downtown with the University of Washington starting in March. One of the new stations is located in Capitol Hill across the street from the old post office. Ironically, reports Don, throughout the wealthy, young people's neighborhood is an influx of homeless citizens. Broadway Station was the first post office yours truly visited in Seattle, during a two-week respite during my first road trip back in 2008. The former location closed Jan. 30, 2016; here are photos as it looked during my visit in 2008 and at the beginning of this year. Note: all the recent photos are Don's. The photos suggest that the Postal Service and its landlord had not been heartily maintaining the building: The letters on the awning were peeling and the building had long been tagged with graffiti. According to Don these signs of physical deterioration occurred long before the landlord announced that the facility would demolished to make way for a more profitable mixed-use building. The building had housed the Broadway post office since 1952. USPS's Leased Facility Report says that the 6,047-square foot facility had been leased for $135,000 per year under the terms of the most recent contract. The Leased Facility Report has not been updated recently enough to reflect information for the new location. With more than 5,000 square feet of retail area, the former OfficeMax space is small by box store standards but was likely too large for many independent retailers. 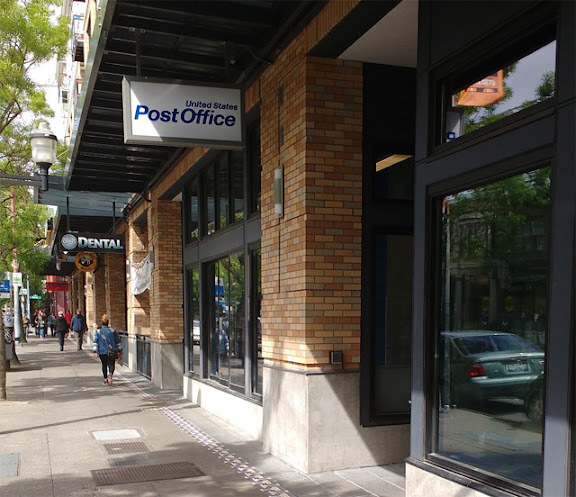 USPS says it plans to occupy about 4,200 square feet of the space, leaving the potential for another small retailer to move in. 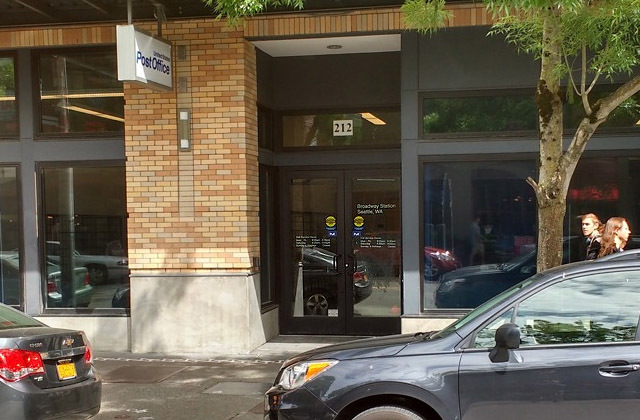 The smaller retail space reflects multiple changes that have been proposed to local mail service in this Seattle neighborhood. Consolidations would affect carriers, nearby P.O. Box customers, and the community at large; but they have not always been implemented. In 2013 CHS reported that "Broadway-based mail carriers — and their vehicles — would be moved to a new 'consolidated' facility at 4th and Lander." 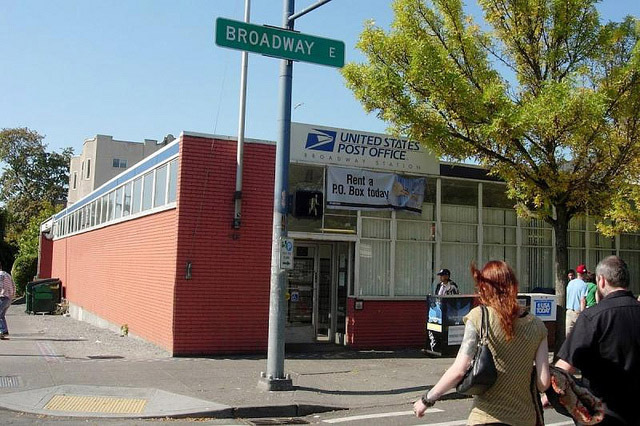 Furthermore, USPS "announced a plan to move the Central District's retail location at 23rd and Union to "a smaller, more cost-effective location" ... [T]he PO boxes from 23rd/Union are destined for a new home on Capitol Hill with customers being transitioned to the Broadway at Denny post office." While carriers have been consolidated, USPS maintains its presence at the latter location. Don photographed the new Broadway post office on its opening day. While it was providing the usual postal services, the post office itself was still a work in progress: The old OfficeMax sign was still outside the building; there was no identification of the facility as a post office, even with standard stencil lettering on the door; and many of the rental boxes did not yet have locks on them. Furthermore, there was no blue collection box in front of the post office. Below: the new Broadway Station post office on February 1, opening day (top), and in early May (center, bottom). The facility has since received its new signage and stencil lettering on the door. There is nothing physically notable about the facility. It bears standard Retail Standardization, minimalist signage. The interior appears to bear some differences from the same modern blue-and-wood motifs that have been implemented at new facilities over the past few years. Capitol Hill Seattle features more photos here. Unfortunately, the post office still hosts no exterior collection box. This violates the Postal Operation Manual, section 315.32: "Provide a regulation collection box at all ... classified stations and branches." Thanks again to Dan for the information and photos; and to Capitol Hill Seattle for its great reporting.